Begin your tour at the Baker Exhibit Center. A Garden Guide will lead the group through three acres of exhibit gardens and may include descriptions of garden design, seasonal plants, the Arboretum’s history, art and general gardening information. Gardens on the tour include the Heritage Garden, signature Quilt Garden, Stream Garden, Bonsai Exhibition Garden (general information only) and the Plants of Promise Garden. Large groups will be divided into groups of 12 to 15 persons and tours last 1-1.5 hours. Please allow extra time for lunch at the Bent Creek Bistro and shopping at the Connections Gallery gift shop. Book a Guided Garden Tour now! 10 person minimum, 60 person maximum, $5 per person. A Trail Guide will lead small groups on one of the Arboretum’s many trails, highlighting the plant and animal communities as well as the natural history of the region. Get close to the creek and out in the woods in a safe and beautiful environment! Large groups will be divided into groups of 15. Please plan for a 1.5 to 2 hour walk over a 1 to 2 mile route. Book your Guided Trail Tour today! 10 person minimum, 45 person maximum, $5 per person. Visit the 7,200 square foot production greenhouse and learn how plants are produced for use at the Arboretum. Details on the integrated pest management program and use of beneficial insects will also be discussed. Due to limited space in the greenhouse, tours are not wheelchair friendly and not recommended for individuals that cannot stand for entire hour tour. Tours are scheduled Tuesday- Thursday between 8:00 a.m. and 2:00 p.m. Reserve your group’s Greenhouse Tour here. No minimum, 20 person maximum. $125 per group. *Other specialty tours are available by special request and require a three to four week notice. 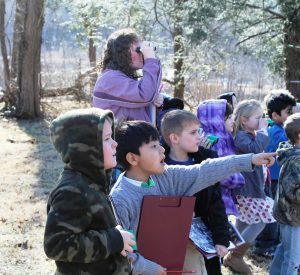 The Arboretum’s popular guided student field trip programs are offered Wednesdays, Thursdays and Fridays. The schedule opens in late August for field trips in September through May. Scheduling several months in advance is highly recommended. Please click here to learn more about programs and pricing. From April – October, The North Carolina Arboretum leads free weekly guided walks. Walks begin in the Baker Exhibit Center lobby and last 1-1.5 hours, depending on the interest of the group. Tours are available on a first-come, first-served basis, and groups of 10 or more are asked to book a guided walk in advance by calling 828-665-2492 x. 314. Walks are FREE, however, donations to The North Carolina Arboretum Society are appreciated. Regular parking fees apply. Looking for more information on the Arboretum’s private group tours?